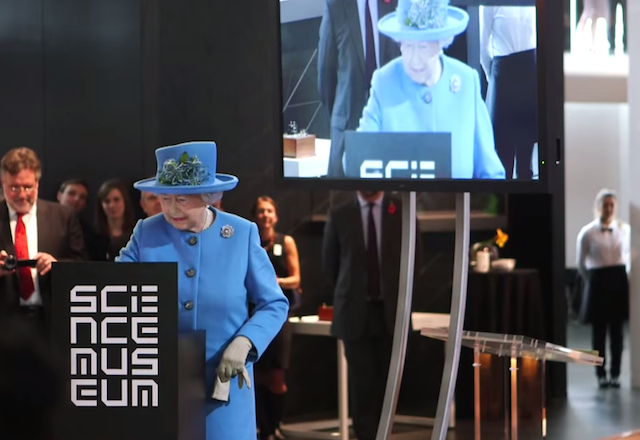 And so it came to pass, October of late, that the Queen declared the Information Age exhibition open. The Royal glove was carefully withdrawn, an august digit extended, and with the press of a button the first monarchical micro-missive was dispatched into the Twittersphere. Dude on the left suddenly realises he's set the Queen up on Chatroulette rather than Twitter. We've been patiently waiting for Half Term to sod off, so that our plebeian eyes might glance around the gallery. We finally made it this week. The first thing to say is that it's BIG. If, like us, you want to read every label and watch every film, it'll take you something like six hours. Fans of infernal numerology will note that the number six appears twice more. 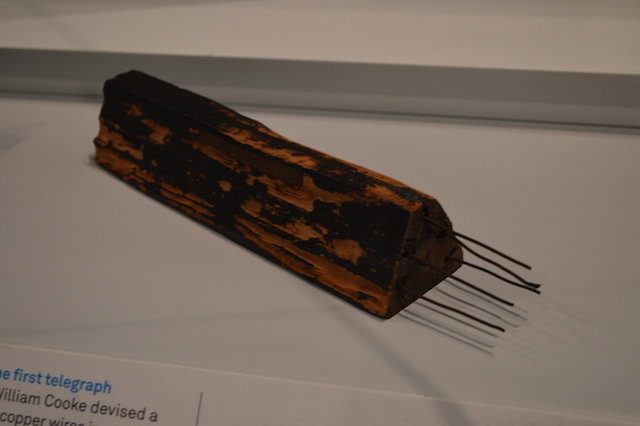 The centrepiece of the gallery is a six-sided tuning coil from Rugby Radio Station. Arranged around it, you'll find a hexad of themed areas corresponding to six networks that changed our world: The Cable, The Telephone Exchange, Broadcast, The Constellation, The Cell and The Web. We'd recommend heading up onto the mezzanine walkway and taking a turn of the hall before you get stuck into the exhibits. The arrangement of the gallery isn't particularly obvious from ground level, and there are no suggested route signs to help you orient. The view from above. That brown spindly thing in the distance is a tuning coil from Rugby Radio Station. Once you do get started, things soon get addictive. Almost every cabinet has something to make you whoop or ponder. Plenty of late 20th century gadgets will satisfy nostalgists, but it's the really old stuff that is truly interesting — especially the relics of London's experiments with communication. 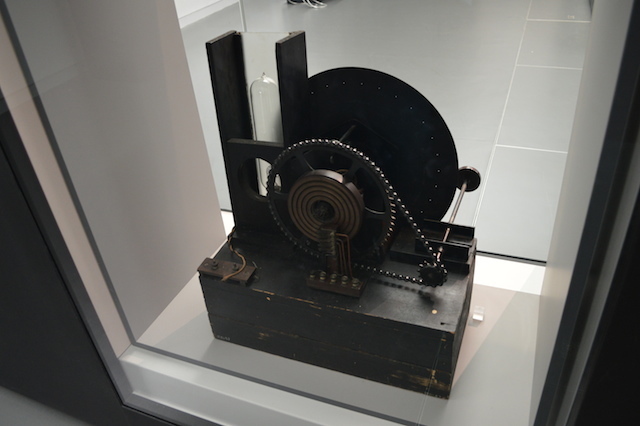 Here, for example, is the very equipment used by John Logie Baird during his first public demonstration of television. Doesn't even have a remote. Piece of crap. That first experiment took place in Soho, above what is now Bar Italia on Frith Street. The section on telegraph cables should not be missed, if only because their story is perhaps less well known than that of telephones and satellites. It's hard to appreciate now just how magical the telegraph must have seemed, especially when the first transatlantic cables cut communication times between the continents from weeks to seconds. 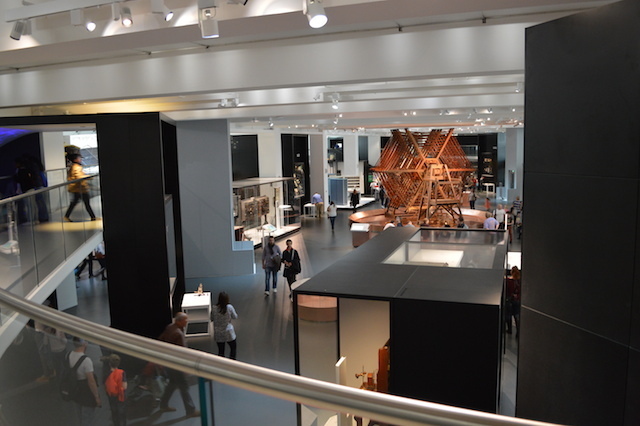 On a more local scale, the gallery holds remnants of the first ever commercial telegraph system (1837), which sent messages between Euston and Camden Town. It looks like some menacing species of Toblerone. Of the numerous large exhibits, it's delightful to see the BBC's 2LO radio station stretched out in all its valve-and-coil glory. 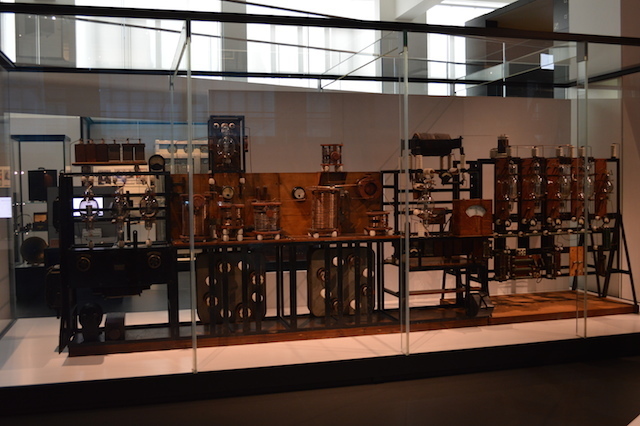 This was the BBC's first radio transmitter, active from 1922 to 1930 from its home on Strand. 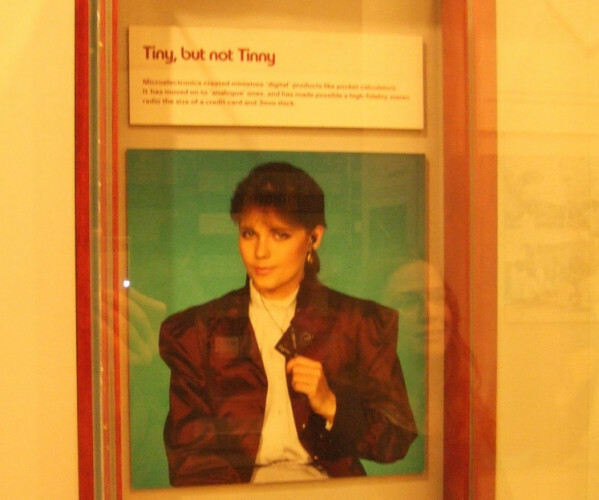 2LO has been skulking unobserved for the past decade in the museum's storage facility, but it thoroughly deserves its prominent placement in the new gallery. The Queen's tweet at the opening ceremony wasn't just a clever touch of PR. The Royal Family has form when it comes to communications technology, as the gallery shows. Her Majesty commanded the largest television audience of the 1950s, with some kind of weird hazing ceremony called 'The Coronation' to welcome her into the job she still occupies. The exhibition shows how the year-long preparations for the jamboree prompted numerous televisual innovations, for what became the largest outside broadcast to that point. Elsewhere, the gallery tackles the rise of satellite communications, the beginnings of the Internet and World Wide Web (including Tim Berners-Lee's computer), and the smartphone revolution. There are many human stories among the techno-wonders too. For example, a small alcove explores the foundation of the Samaritans — a lifesaving use of the phone completely unforeseen by its inventors. 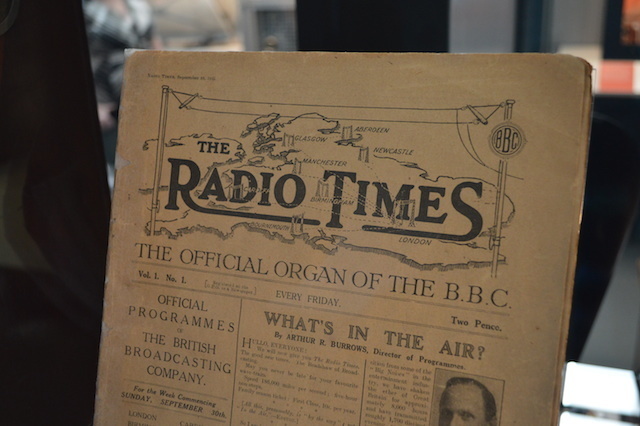 The very first Radio Times. Smirk. Organ. Smirk. In terms of content, the gallery could hardly be richer or more engaging. It's not quite a five-star job, however. The labels are clear and well-written, but placed so haphazardly that we can only deduce some kind of mis-communication between museum departments (ironic given the theme). Spend a few hours here and you'll succumb to mild bouts of gallery rage, trying and failing to track down an object from its randomly positioned label. One cabinet of numbered curiosities entirely lacks labels. About one-third of the digital displays were malfunctioning, too, as were the lifts. Clearly some teething troubles, then, but if you can tolerate this minor sloppiness, you'll find a gallery to rival any other in the boundless museums of South Kensington. Plus, this one's got the royal tweet of approval.